Mexican President Enrique Peña Nieto and U.S. President Barack Obama tried to de-emphasize the role of security in U.S.-Mexican relations, but events made that difficult. Now human rights abuses are a growing concern. The State Department’s decision is symbolically important, but Mexico’s muted reaction was perhaps even more surprising. The Mexican government limited its response to a statement that criticized “unilateral practices,” but painted the aid cut as a consequence of U.S. executive–legislative relations. The focus was instead on the “deep and mature bilateral relationship” between the two neighbors. The muted Mexican reaction is no doubt a reciprocation of the State Department’s low-key handling of the issue and recognition of the fact that most aid money continues to flow, but also a reflection of the evolution of Mexican foreign policy toward the United States. Changes in Mexican politics and the “maturation” of bilateral ties allow U.S. policymakers to give greater weight to human rights without jeopardizing the broader relationship. The United States should use that space to respond to the growing concerns of Mexican citizens about human rights and accountability while reevaluating the failing military-led response to Mexico’s insecurity. Read the rest over at War on the Rocks. Thanks to the U.S. Foreign Policy program at American University for the invitation to present my new book there today. It was an honor to launch the book where it all began. My former professor and current co-author Max Paul Friedman offered an incredibly kind introduction (which I wish I had recorded to listen to when I feel blue). It was fantastic to see a number of former students in attendance along with my former PhD and faculty colleagues. The book will officially be out in just a few days. You can find out more at the Cambridge site and pre-order or get a Kindle version at Amazon. The price is a little (by which I mean a lot) steep, so if you can’t bring yourself to spend that much on a book, consider recommending it to your librarian so that you and all your neighbors can read it! There is ordering information on a flyer in the photo gallery above. Having passed their seventieth anniversaries, the institutions created in the New Hampshire town of Bretton Woods remain at the heart of the global economy. The slew of criticism aimed at the International Monetary Fund and the World Bank in recent years only underscores their relevance, even as many critics argue the organizations are out of touch with the world’s shifting balance of economic power. Criticisms continue that the IMF sacrifices the fate of the world’s poor on the altar of failed macroeconomic policy models. Many have traced both these flaws—inadequate attention to development and U.S. and European dominance—back to the organizations’ founding. 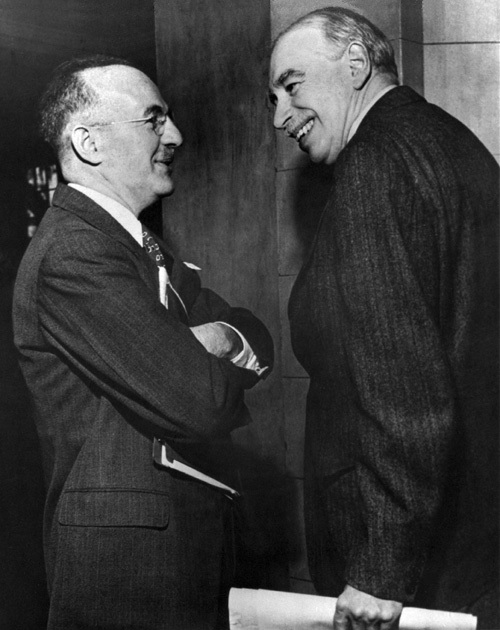 Crudely summarized, the most frequent account of Bretton Woods emphasizes the leading roles of the U.S. official Harry Dexter White and British economist John Maynard Keynes. While the two advanced somewhat different plans, both focused overwhelmingly on the IMF, which prioritized monetary stability among high-income countries. The World Bank—then limited to the International Bank for Reconstruction and Development (IBRD)—was intended to address Europe’s post-war problems. Development was tacked on as an afterthought. White and Keynes hashed out the details. The United States, at the height of its power and increasingly the world’s financial capital, won most of the battles and thus drew up the plans for the post-war economic order. This rough version is pretty firmly ensconced. It is also consonant with more recent criticisms of the Fund and Bank. That makes Eric Helleiner’s carefully researched account all the more interesting. Helleiner convincingly makes two overarching points, 1) a number of developing countries—particularly in Latin America—played important roles in the creation of the Bretton Woods institutions during the Second World War; 2) Latin American officials and their counterparts in the Franklin D. Roosevelt administration were much more focused on development that is commonly thought. These negotiations, Helleiner argues, have been viewed through the lens of what came later, when the more conservative Truman and Eisenhower administrations pushed for greater orthodoxy.